Chicago’s referendum on a $15-an-hour minimum wage is the latest round in the fight for higher wages in the city. In recent years, proposals to raise the city’s minimum wage have failed to win support in City Hall. But on Tuesday, labor activists and progressives celebrated the symbolic victory they say is needed to press for a pay hike for Chicago’s lowest-paid workers — many of whom are African Americans, Latinos and immigrants. The measure was on ballots in 103 precincts across 20 of the city’s 50 wards — reaching about 5 percent of registered voters — half in predominantly African American communities on the South Side. With 100 precincts reporting, 86 percent of the roughly 9,800 voters who cast ballots supported increasing the minimum wage. The non-binding referendum targeted companies earning more than $50 million annually, mirroring national efforts by focusing on large and mostly non-union employers to avoid push-back from small businesses. The vote came at a time when the chorus of discontent about a range of issues in Chicago, from jobs to the increasing cost of living, is growing louder. Meanwhile, the living wage movement is gaining steam as well. Other supporters included 4th Ward Ald. Will Burns and 1st Ward Ald. Joe Moreno, who are not members of the reform coalition. Though Mayor Rahm Emanuel and Gov. Pat Quinn both have advocated for increases to the minimum wage, neither proposal comes close to the $15-an-hour wage supporters of Tuesday’s referendum want. Emanuel’s plan for a city minimum wage (if the state does not increase it) calls for a $1-an-hour increase for the next two years, with further increases pegged to inflation. Quinn wants an increase in the state’s minimum wage from $8.25 to $10 an hour. Tuesday’s referendum was spearheaded by the Raise Chicago coalition, an umbrella group of labor and community organizers including ONE Northside (formed with the merger of Organization of the NorthEast and Lakeview Action Coalition), the Grassroots Collaborative and Action Now. Burns said the referendum highlighted the plight of the growing number of low-wage workers. Nationally, organizers of the living-wage movement are pushing local government to support wage increases tied to the cost of living in a specific community — not a minimum set by state or federal government. Tuesday’s referendum was designed to gauge public opinion on the subject. The measure received the most support in predominantly African-American wards on the South and West sides, such as the 20th (96 percent in favor) and 28th (95 percent). 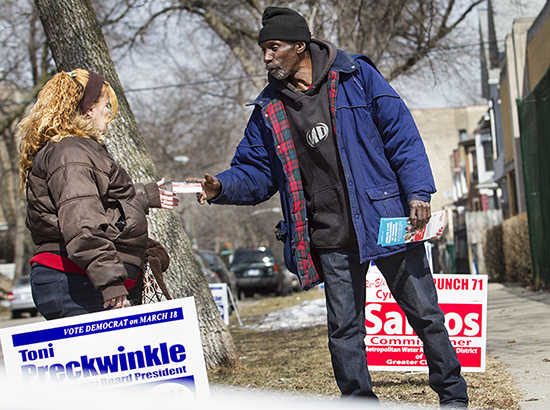 It received less support in the predominantly white wards on the Northwest Side, such as the 35th and 48th (62 percent). While a handful of cities have established a minimum wage, organizers in Chicago have struggled to get support at City Hall. A 2006 ordinance sought to require billion-dollar retailers with stores larger than 90,000 square feet to pay their workers $10 an hour. The proposal passed the City Council by 35-14 and had significant public support, but then-Mayor Richard M. Daley vetoed it. And in 1996, labor unions and local community organizers pressured City Hall to consider a living wage ordinance for developers in TIF zones — tax increment financing zones, which are special districts created to plow tax dollars back into area development. The ordinance would have increased the minimum wage by 79 percent, to $7.60 per hour, for employees of developers who received city money or other municipal benefits. Daley refused to support the ordinance, claiming it would overburden Chicago’s budget. Chicago’s referendum adds fuel to the living wage movement, which is gaining momentum after decades of grassroots campaigning by labor unions, community organizers and other groups. Public support, too, is strong: A March 2013 Gallup Poll found that 70 percent of those surveyed were in favor of a hike in the minimum wage, including 90 percent of Democratic voters and 50 percent of Republican voters. In the last two years, four states have passed bills to raise the minimum wage: California, Connecticut, New York, and Rhode Island. Cities including Albuquerque, Santa Fe, San Francisco, Seattle and Tacoma increased their minimum wages above the federal level of $7.25. And last month, President Barack Obama signed an executive order increasing the minimum wage for federal contract workers to $10.10 per hour from $7.25. He has called on Congress to do the same and raise the federal minimum wage, as part of his second-term focus on reducing income inequality. “I think Obama is responding to pressure from what’s been happening in the states and localities, who are taking matters into their own hands,” said Alice O’Connor, a poverty scholar and public policy professor at the University of California at Santa Barbara. Raising the wage is important, she added, because “such a big part of inequality is the erosion of the minimum wage at the bottom.” Adjusted for inflation, the current minimum wage is lower than it was in 1968, according to data analysis by the Bureau of Labor Statistics. The living wage movement has been building since the 1970s, O’Connor said, when the standard of living of the working class began to erode and the income gap between the working class and the wealthiest Americans began to grow. The wage decline coincided with the decline of organized labor, and the 2008 recession exacerbated the trend, and sparked the current public discussion on income inequality, she concluded. Patrick Brosnan, executive director of the Brighton Park Neighborhood Council, works with the Center for Economic Progress to provide pro bono tax filing services for low-income families. He said it’s normal to see people who have up to seven W-2 forms earning less than $10,000 a year.